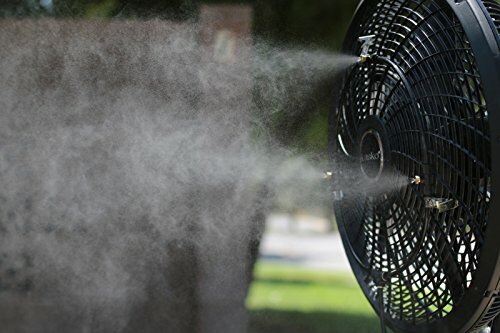 Turn your fan into an outdoor cooling misting fan. The Ring Pictured in action is a 12" 3 nozzle misting ring. We currently have 4 fan misting rings to choose from. These rings are made of 1/4" tubing. Each ring comes with 20' of leader tubing with water spigot adapter, and fan mounting clips. Every one of our misting rings is hand assembled and inspected by us to ensure quality. We use top quality components to ensure the longevity of your misting ring. Our LLDPE tubing is 236 psi NSF rated and UV resistant so it will last a long time. The Nozzles are Brass or Nickle Plated with a stainless steel orifice, Murlock water spigot connector with dual EPDM O-rings to ensure a leak-proof connection. Minimum operating pressure is 35 psi Maximum pressure is 100 psi. 1.) 8" 2 nozzle ring fits 8" and up fans 2.) 12" 3 nozzle ring fits 14" and up fans 3.) 12" 4 nozzle ring fits 14" and up fans 4.) 16" 5 nozzle ring fits 18" and up fans. If you have any questions about this product by AZCOOLMIST, contact us by completing and submitting the form below. If you are looking for a specif part number, please include it with your message.